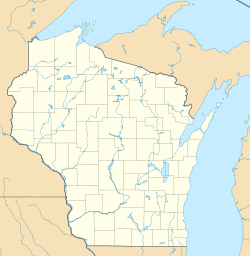 Harrison is a former community in the town of Harrison, Calumet County, Wisconsin, United States. Harrison was settled in the 1870s around a Catholic church and school between Stockbridge and Sherwood. The church's first priest was Rev. John Adt. The original community has been a ghost town since before the 1970s and the only remnant of that community is the church's cemetery. ^ a b "Harrison, Wisconsin". Geographic Names Information System. United States Geological Survey. ^ a b Edens, Mrs. Dale (January 18, 1973). "Historical Insight". Chilton Times-Journal. This page was last edited on 5 September 2018, at 20:14 (UTC).